The team from Loyola School in Essex claimed the title of ESFA Danone Nations Cup U11 Small Schools National Champions in May, following the National Finals held at Stoke City FC. The team, who had already been successful throughout the District, County and Regional rounds of the competition, had the chance to experience playing and indeed, winning on a Premier League pitch in May as the National Finals took centre stage at the Stoke City FC Stadium. Playing against seven other teams from across England, Loyola were successful in their campaign to top the table and took the National Champion status for 2017 following a 2 – 0 win against Baston School from Lincolnshire. The team will be celebrating their win at Spurs home match v Stoke City at Wembley Stadium on Saturday 9 December as a well-deserved treat from the English Schools’ FA and Danone for their continued success throughout the 2016-17 Schools’ Football season. 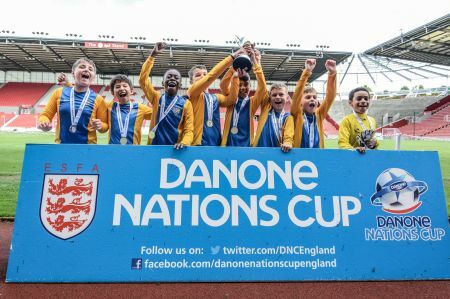 The ESFA Danone Nations Cup competition is the England leg of the world’s biggest international football tournament for 10 to 12 year olds – the Danone Nations Cup – with 32 countries participating each year. The first rounds of the 2017-18 competition are already underway in England, ready for new National Champions to be crowned in May 2018. The ESFA and Danone would like to thank Tottenham Hotspurs for helping us to celebrate the boys' success and hope the team have a fantastic experience at Wembley on the 9th!